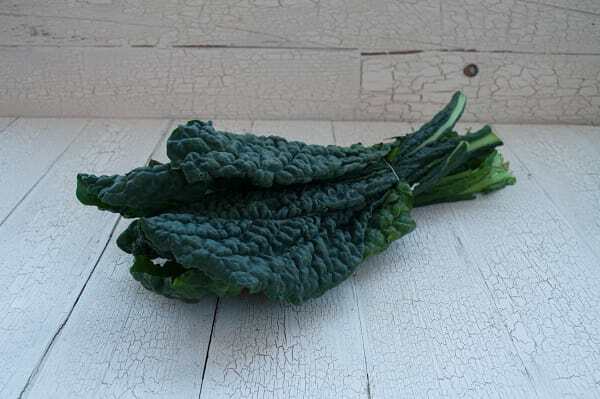 Lacinato kale has a much richer flavour, and is more tender, than the most common types of kale. Also known as dinosaur kale, it gets this latter name from its wrinkly texture. Try Lacinato kale braised, or in a soup with white beans, garlic, and tomatoes. This product traveled 1657 km to reach our warehouse. Storage Tip: Store kale in the coldest part of the fridge in a plastic bag. Although kale keeps well, the texture deteriorates and the flavour becomes stronger with time. Preparation Tip: Stems are edible but best to use a knife to remove any that are thicker than a pencil as they are quite tough. Culinary Compatibility: Ginger, garlic, pine nuts, sesame oil, fresh herbs. Health Information: Kale is very high in vitamins A and C and is a good source of iron, calcium magnesium, potassium, thiamin, riboflavin, folate and vitamins B6 and E.